While admitting particular parameters and priorities for Roman Catholic preachers, this volume was intentionally envisioned as a handbook for "catholic" preaching in the broadest and most universal sense of that term. Cosponsored by the Catholic Academy of Liturgy, the Catholic Association of Teachers of Homiletics, and the Federation of Diocesan Liturgical Commissions, it covers the role of the Scriptures in preaching, the challenges of preaching in a digital age, sermonizing in an interfaith context, and the need for a liberative and prophetic word that cuts across denominations and even faith traditions. Intended to aid those who teach or direct the preaching arts, the design and writing style of this book are particularly calibrated to graduate students in ministerial studies. Every article is a self-contained overview of a particular historical period, genre of preaching, homiletic theory, or contemporary issue. This more encyclopedic approach—devoid of footnotes, yet supported by pertinent bibliography and an extensive index—provides a sufficiently rich yet thoroughly accessible gateway to major facets of the preaching arts at this stage of the twenty-first century. "This excellent volume should be on the bookshelf of every seminarian, theology student, and homilist." "Although the primary concern of this book is with Roman Catholic preaching, it is an invaluable resource for Protestant preachers to learn about Christian preaching. The book presents comprehensive knowledge about preaching in theory and practice, as well as a rich history of Christian preaching throughout two millennia. The essays in this book, written to the point and in depth on crucial subject matters of homiletics, are excellent teaching materials for both introductory and advanced preaching courses." 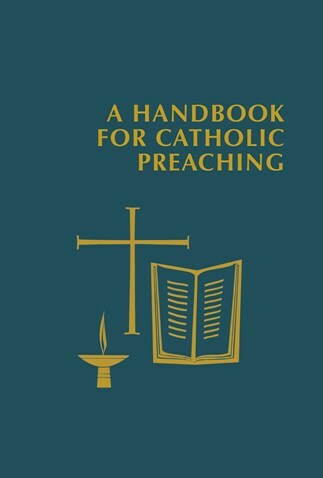 "A Handbook for Catholic Preaching is very well organized. It provides an excellent overview of historical, theological, and spiritual approaches. It is a valuable resource filled with a wealth of information on preaching that can be helpful for all levels of experience." "This handbook covers basic issues related to preaching. It could profitably be used in introductory courses about preaching in universities and seminaries." "A critical addition to the contemporary body of writing and research on preaching. This book will delight and refresh, inspire and challenge anyone who is a lover and preacher of the Word. In entreats and obligates every preacher and any believer to acknowledge where we have come from, see where we are now, and envision our forward movement in the art of preaching." "It is a treasure of all the `do's' and `don'ts' of preaching. It belongs in every seminary library and all libraries interested in the Catholic Church and preaching." "An excellent example of contextual theology in which a diverse community of contemporary scholars collaborates to uncover the theological depth and cultural complexity of the preaching ministry, its role in the life of prayer, and it methodological possibilities in the church today." "For the busy pastor or preacher, as well as for all of those inspired by Pope Francis's call to share the joy of the Gospel with others, here is a trustworthy one-volume resource for insights on preaching from the time of the New Testament to the digital age. Crafted by experts in the fields of liturgical studies and homiletics and experienced preachers and teachers, these essays provide an excellent introduction to the history, theory, and art of preaching. At once informative and inspiring, pastoral and practical, A Handbook for Catholic Preaching draws on the riches of the sacramental imagination and addresses opportunities and challenges for preaching in diverse cultural, ecumenical, and interfaith contexts. An essential resource for pastors and preachers as well as for professors and students of homiletics."